VIC MIGNOGNA of Star Trek Continues plays ANOTHER famous CAPTAIN in a new DEADPOOL fan music video! VIC MIGNOGNA is known in the fan film community for playing Captain Kirk in Star Trek Continues. 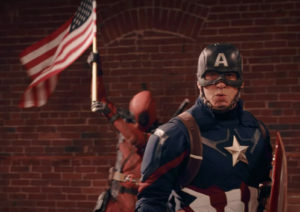 But now he’s going to be known for playing another famous captain: Captain America (and providing the voice of the X-men’s Beast)…in one of the funniest, most ambitious, and most entertaining fan film mash-ups ever produced. I know I usually focus on Star Trek fan films, not superheroes, but in this case, there’s a number of veterans of Star Trek Continues involved, including make-up artist LISA HANSELL…and heck, even ROD RODDENBERRY is listed in the credits as an associate producer! Anyway, get yourself mentally prepared for one of the best-crafted fan films you’re likely to see all year. Oh, and ask the kids and religious zealots to go play in the yard for the next twelve and a half minutes…’cause this fan parody is just as R-rated as the two Deadpool movies that inspired it! I mean, there are just no words…well, yes there are, but I can’t type most of them on my blog ’cause I’m such a prude! But hey, did you know that this amazing fan film would NEVER have happened if it weren’t for Star Trek Continues? Cross my heart and hope to have Wolverine give me a prostate exam! Author Jonathan LanePosted on October 19, 2018 October 19, 2018 Categories Fan Film Features, NewsTags Deadpool the Musical, Michael Parker, Star Trek Continues, Vic Mignogna3 Comments on VIC MIGNOGNA of Star Trek Continues plays ANOTHER famous CAPTAIN in a new DEADPOOL fan music video! Life after STAR TREK CONTINUES – cast members REUNITE for WHEN THE TRAIN STOPS! When STAR TREK CONTINUES completed its 11-episode run of superb Trek fan films, fans of the series wondered, “What’s next?” It seemed a shame that such a talented group of actors, writers, directors, and production crew would simply go their separate ways. Alas, that is all too often the case in show business. But not this time…at least, not for everyone. Although many members of the STC team did, in fact, move on to other endeavors, a small number reunited for a special independent short film project titled WHEN THE TRAIN STOPS. The cast included STC alumni VIC MIGNOGNA (Captain Kirk) along with veteran Trek actors JOHN “Q” DeLANCIE, REKHA SHARMA (from Star Trek: Discovery and the new Battlestar Galactica), and MICHAEL FOREST (who played Apollo both in the original series episode “Who Mourns for Adonais?” and also in the first full-length STC episode “Pilgrim of Eternity“). STC cast member (and writer) KIPLEIGH BROWN was initially slated to appear in Train… but had to pull out at the last moment due to a family emergency. She was replaced by Rekha Sharma. An Indiegogo last November reached its $43,000 goal with just eight hours to spare, allowing the campaign to extend indefinitely as “In Demand” status. Since then, their donation total has grown to more than $51,000…allowing them to not only film all the scenes but also to wrap up post production and release a completed film, which happened in mid-September in a special early release perk for certain donors. The rest of the donors (like me) got to view it as a private download early this past week. And let me tell you, it was EXCELLENT! The 20-minute film was expertly crafted with an engaging story that provides a wonderful Twilight Zone twist at the end. It’s definitely worthy of viewing. So when can YOU see it? 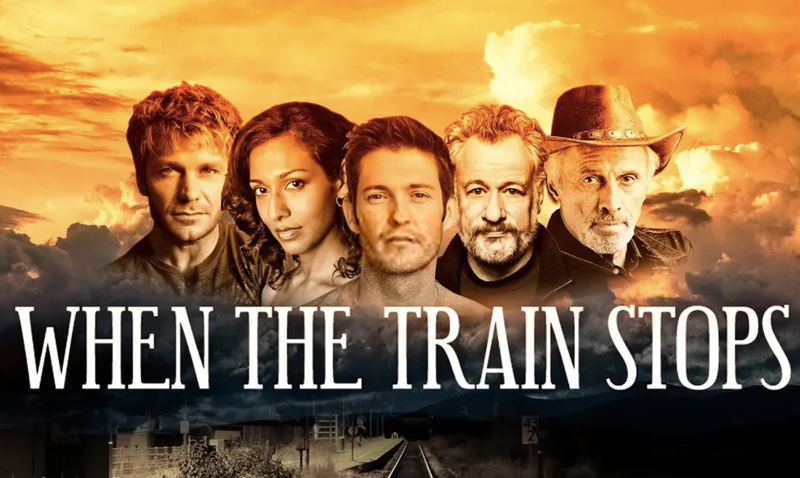 Author Jonathan LanePosted on October 6, 2018 Categories Fan Film Features, NewsTags James Kerwin, John de Lancie, Lisa Hansell, Rekha Sharma, Star Trek Continues, Vic Mignogna, When the Train Stops4 Comments on Life after STAR TREK CONTINUES – cast members REUNITE for WHEN THE TRAIN STOPS! TREKYARDS and VIC MIGNOGNA go behind-the-scenes of STAR TREK CONTINUES! TREKYARDS is a force of nature in Star Trek fandom. 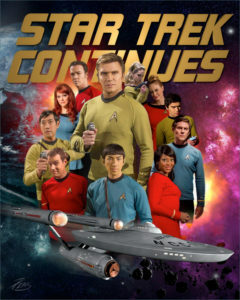 So is STAR TREK CONTINUES. Put the two of them together, and there’s something really special in store for Trekkers! Trekyards, for those who don’t know, is the brainchild of STUART FOLEY and SAMUEL COCKINGS. Together, these two uber-fans have produced more than 500 webshow videos spotlighting ships from Trek and other sci-fi franchises, interviewing actors and production people from Star Trek, doing video podcasts, and filling the Internet with enough smart, funny, and fascinating content to eat up as much of your free time as you desire! 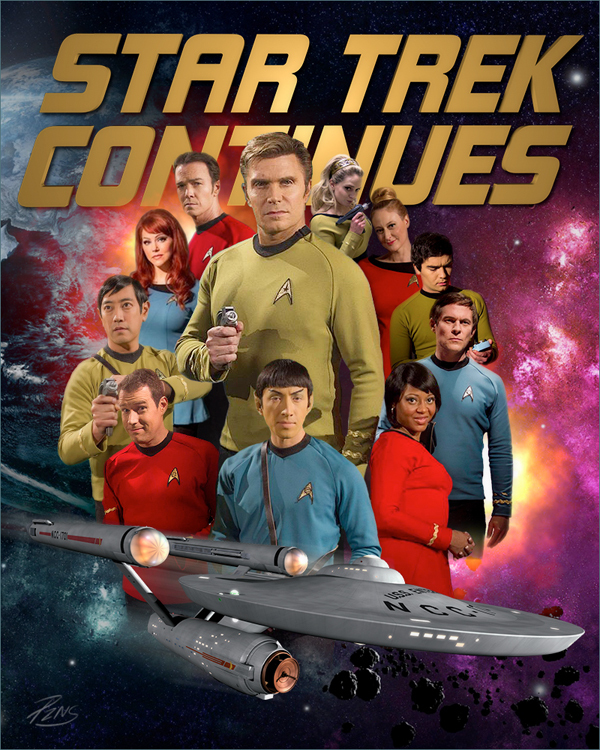 Star Trek Continues, as you undoubtedly know, was a cutting edge fan series that presented the final two years of the USS Enterprise‘s 5-year mission under James T. Kirk. Using professional actors and technical crew, featuring noted sci-fi celebrities as guest stars, and displaying industry-level production quality on exact recreations of the TOS sets, STC set a standard of excellence seldom if ever matched in the realm of Trek fan films. Although STC has completed its 11-episode run, fans still cherish this labor of love and the careful attention to detail that went into it. And while STC has released a few special features here and there focussing on things like the music scoring, editing, and VFX—and Fan Film Factor published this exhaustively-researched complete history of STC—there hasn’t been a real “deep dive” into all of the behind-the-scenes production secrets of this amazing series. Trekyards is introducing a new webshow series spotlighting Star Trek Continues, hoping to cover EVERY fascinating detail of this beloved fan project with insight from those who produced it. 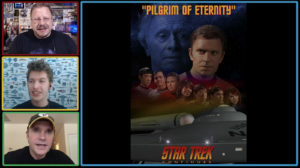 Up first, in a 20-minute interview about their first episode, “Pilgrim of Eternity,” Captain Kirk himself, VIC MIGNOGANA, talks about finding and convincing retired actor Michael Forest to reprise his role of Apollo, Vic’s feelings about other Trek fan series, and what gravity has to do with the color of the walls on the set! Author Jonathan LanePosted on June 21, 2018 Categories Fan Film Features, NewsTags Samuel Cockings, Star Trek Continues, StuartFoley, Trekyards, Vic Mignogna7 Comments on TREKYARDS and VIC MIGNOGNA go behind-the-scenes of STAR TREK CONTINUES! 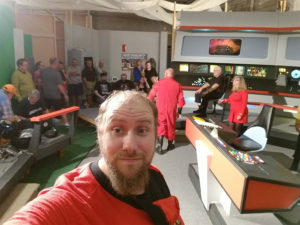 The former STAR TREK CONTINUES sets are now OPEN for FAN FILMING! 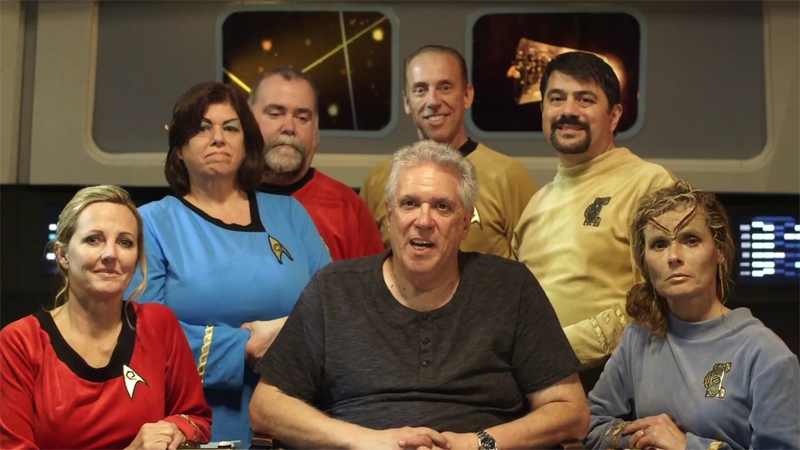 Back in February, the fan film community was ecstatic to hear that RAY TESI of Florida had purchased the TOS sets that had been previously used by the fan series STAR TREK CONTINUES and STARSHIP FARRAGUT. Prior to that, fans had been very worried since these incredible sets—used for nearly two dozen fan productions—were costing VIC MIGNOGNA a reported $5,000/month in rent to house and maintain. Nobody wanted the sets tossed into a dumpster, but with a price-tag of $60K per year and no way to monetize them because there’s already a licensed Star Trek Set Tour in upstate New York, it was unrealistically expensive to keep these sets around. Enter Ray Tesi, who had funded and produced a fan film vignette called STARSHIP REPUBLIC “Serpent of Yesterday“back in 2017. Ray bought the sets, and will be using his retirement savings to pay the rent (Ray tells the behind-the-scenes story in this audio interview). 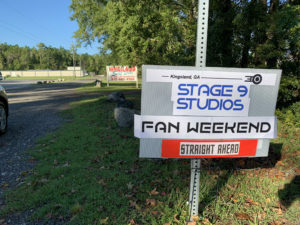 Keeping the name STAGE 9 STUDIOS (previously used by Star Trek Continues for the Kingsland, GA facility), Ray has announced his intention to open the sets up to other fan filmmakers in much the same way that STARBASE STUDIOS had been doing since 2011. There were, however, a couple of big unknowns. The first was a reaction by JAMES CAWLEY reported on Trekzone Spotlight (at the 18:10 mark) that James was concerned that Ray’s offering the Stage 9 TOS sets for fan use would compete with James’ exclusive set tour license. The second unknown was how CBS would react. They are okay with Star Trek fan films as long as they follow the guidelines. 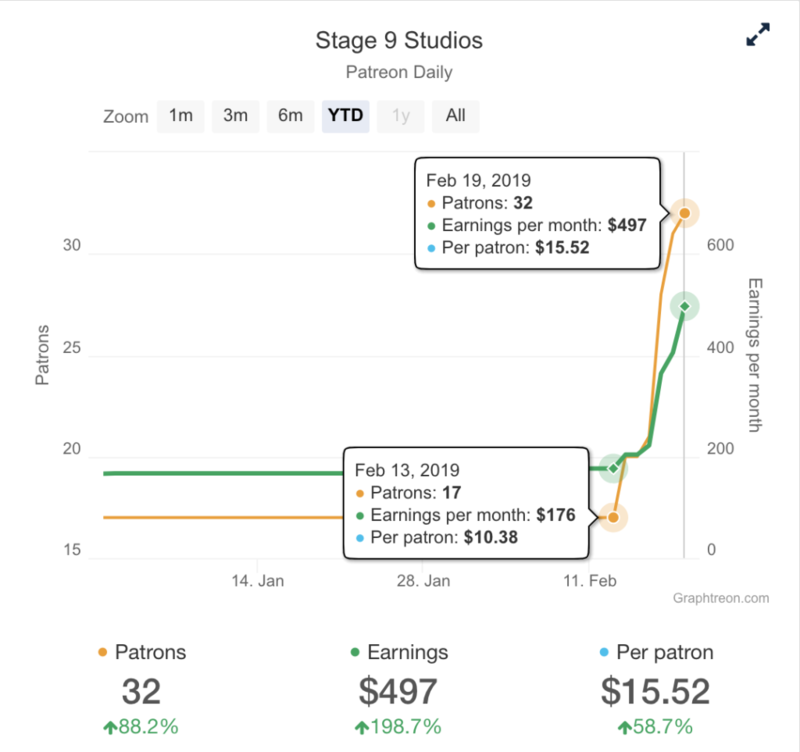 And so far, CBS has been okay with Starbase Studios offering their TOS sets in exchange for fan productions paying only for the electricity they use while shooting there. 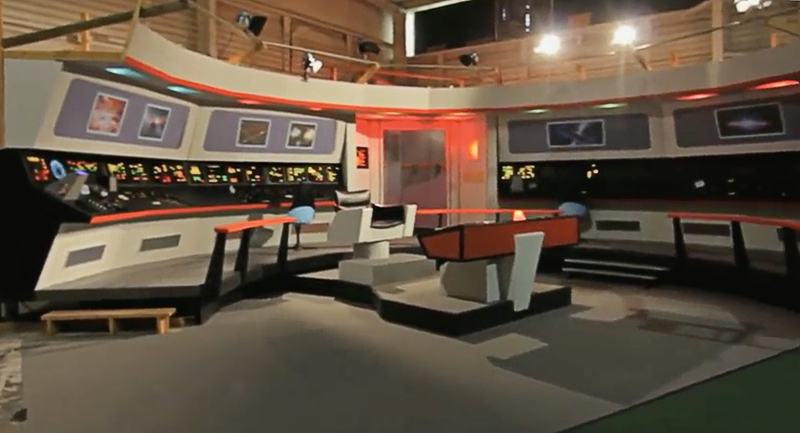 But would CBS continue to look the other way for a second studio full of TOS sets? Ray didn’t want to take a chance, so he contacted CBS directly. 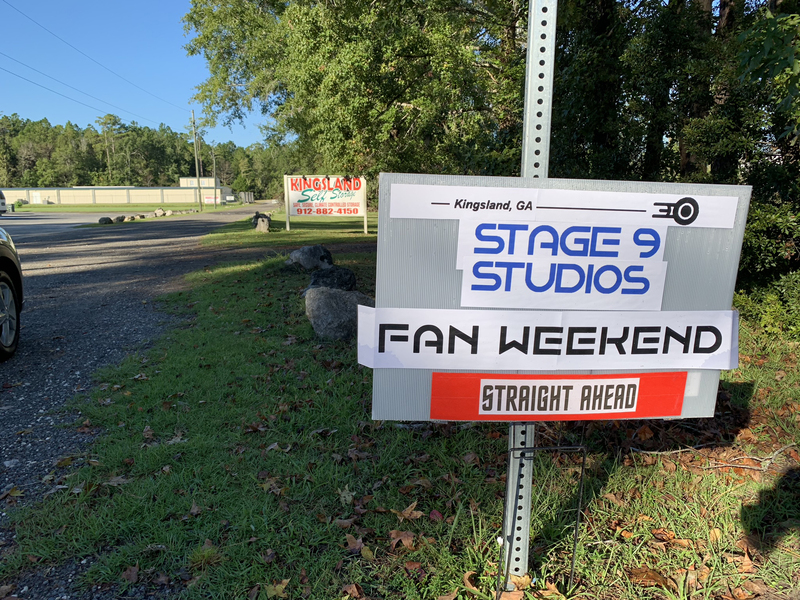 This weekend, Ray has taken a few of the set pieces to MegaCon in Orlando, FL to display publicly and announce that Stage 9 Studios is now open to fan projects. So what did CBS say? And what are the logistics for fan films to use these sets going forward? Time for another Fan Film Factor interview with Ray…! Author Jonathan LanePosted on May 25, 2018 May 25, 2018 Categories Fan Film Features, NewsTags Ray Tesi, Stage 9 Studios, Star Trek Continues, Starbase Studios, Vic Mignogna12 Comments on The former STAR TREK CONTINUES sets are now OPEN for FAN FILMING! 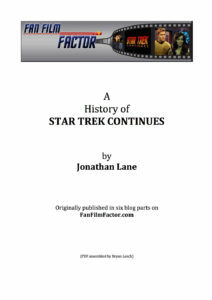 Author Jonathan LanePosted on March 21, 2018 April 16, 2019 Categories Fan Film Features, NewsTags Bryan Leech, Jonathan Lane, Star Trek Continues, Vic Mignogna17 Comments on The complete HISTORY OF STAR TREK CONTINUES…in a single PDF! Fans gave a sigh of relief in early February when it was announced that the STAR TREK CONTINUES sets in Kingsland, Georgia had been purchased by a fan filmmaker who intended to make the sets available to other fan filmmakers to create their Trek fan productions. The new owner is a fellow by the name of RAY TESI, and his own fan project was STARSHIP REPUBLIC, which had released the 9-minute “Serpent of Yesterday“ vignette in February of last year. But I was curious about something: how was Ray affording all this? Y’see, after releasing his fan film vignette, Ray launched an Indiegogo campaign to try to raise $16,000 to continue the production of his fan series. That campaign only made it to $2,351, and the project was shelved indefinitely. Now, I didn’t know whether Ray had purchased the sets from VIC MIGNOGNA of Star Trek Continues or had gotten them for free (turns out Ray bought them). But I did know that the rent for the warehouse where the sets reside is tens of thousands of dollars per year! So how is a guy who needed $16,000 in crowd-funding a year ago suddenly able to afford thousands of dollars a month in rent? Did he win the lottery? Rob a bank? Blackmail a rich politician? It turns out, fortunately(! ), that it was none of the above. In fact, when you hear the actual story behind Ray’s purchase of the STC sets, I think that you—like me—will gain a new respect for Ray Tesi and feel truly inspired and positive about the future of this wonderful fan resource.